People who do Virtualization will surely be used to these two words. VirtualBox and VMWare. And if we compare VirtualBox and VMWare we will find VMWare more user-friendly and powerful. Here in this article, we are going to illustrate the steps to Import and export OVA files in VirtualBox. VirtualBox is a cross-platform virtualization application. It makes our computer capable of running multiple operating systems inside multiple virtual machines at the same time. To be clear considered you have a Mac. With the help of VirtualBox, you can run Windows OS, Linux OS or any OS in you Mac alongside all your existing applications. The number of virtual machines that we can have in our computer directly depends upon the disk space and memory of the computer. VirtualBox is simply and very effective. They can be run on any device from the small embedded systems to desktop class computers and even in cloud environments. While creating a new virtual machine in VirtualBox, the default file format is .VDI. There are predefined options to use the VMDK or VHD format, but there is not an option to import or export the VM of OVA format files. And an important information is that OVF – Open Virtualization Format I one of the methods to standardize virtual appliance for importing and exporting them in various virtualization software. Ova format is nothing but a single file distribution of the OVF stored in the TAR format. 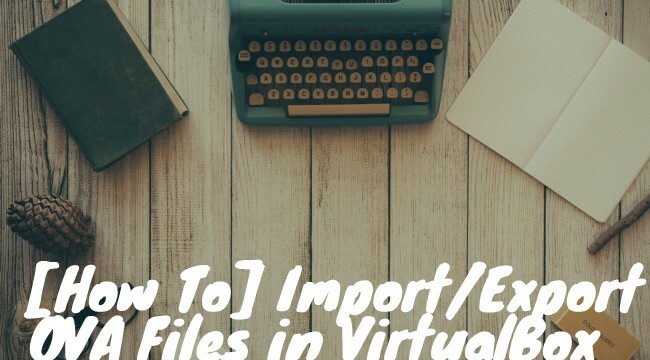 In this guide, we are going to see how to Import/Export OVA files in VirtualBox. Simply follow the step by step mentioned guide below when you are ready with your OVA file which you are going to upload in VirtualBox. Open the menu bar & navigate to File>>Import Appliance. Click the “Open Appliance” button and select your OVA file which you want to import. After selecting the file click the “Next” button. A new window will appear, and it would show the configuration of the current virtual appliance. We can then scroll through the full configuration list. And if we wish to make any change we can double click any item. Double clicking it will either check or uncheck the box. At the end click “Import”. Virtualbox will then take care of importing the selected virtual machine file into our library. Usually, the importing time takes less than a minute and to be exact the importing time wholly depends upon the OVA file size. Once the importing process is over, we could be able to see the new VM on our list. A similar kind of procedure is to be followed to export OVA file. Note: - While exporting from VirtualBox make sure to choose OVF Version 2 and not Version 1 as the Version 1 will generate errors since it is not compatible. Now we need export a VDI file which is the default format for Virtualbox to an OVA file so that it can be used to re-import in another virtual machine. Navigate to the menu bar and head towards File>>Export Appliance. Now it will ask us to select the disk image that we want to export. It might be the whatever OS we are using say Ubuntu, Windows 7, Windows 8, etc. ; It’s also possible to select multiple options at a single time. Next, we have to choose the path and filename where the OVA file needs to be exported. We could notice that Virtualbox, automatically affix a .ova extension to the end of the file. Note: - It is possible to change that file extension as a .ovf extension if we need the file in that format. Doing this creates multiple files in different extensions instead of a single file. Appliance Settings page is the next screen that will appear. Here we can review and edit the appliance configuration. It can be left default instead of changing anything. It works perfectly in the default settings. Click the “Export” button. Firstly the Virtualbox will convert our image to vmdk format (the default in VMWare) then packaging it in OVA format will occur. That is once the export is completed we will have three files: .vmdk, .mf, and .ovf. The .vmdk which are the binary file and the .ovf is the descriptor file for the virtual machine. Then later it will be changed in .ova file. Note: - The OVF standard is very complex, which makes its support in VirtualBox as an ongoing process. Honestly, there is no guarantee that the VirtualBox will support all appliances created by other virtualization software. There are few limitations that every user must go through for better understanding about the VirtualBox.